DNG Maxwell, Heaslip & Leonard has brought to the market this lovely well maintained property in Knockatogher, Athenry. It is situated near Kiltullagh village, approximately 4km from the M6 motorway offering ease of access to Galway City, yet enjoying the rural setting, and adjacent to all amenities to include national school, shop, post office, church, crèche, pub, and community centre. The property extends to circa 2,056sq ft of living space and boasts an impressive B3 energy rating, in addition to many attractive features including extensive Chinese slate tiles, solid pine floors and doors, feature fireplace with solid stove, Aga style oven, and a water filtration system. Ground floor accommodation comprises an entrance porch and hall, open plan kitchen/dining/living room, sitting room with fireplace, guest toilet, and utility, while the first floor comprises four double bedrooms with the master en suite and a main bathroom that is fully tiled. Situated on a site of c0.5 acre, the attention to detail is evident both in the interior and the exterior of the property, featuring well maintained gardens with lawn, flower beds, vegetable patch, and specimen trees and hedging. 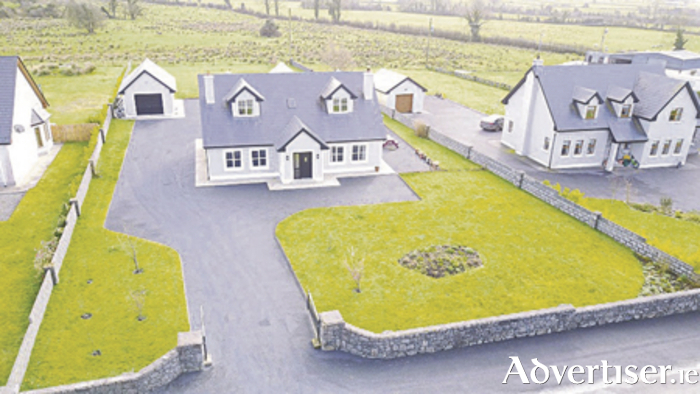 According to selling agent Reggie Leonard MIPAV MCEI, “This is a perfect family home, directly adjacent to all amenities and within easy reach of Galway. This property has the added benefit of being owner occupied which is evident in the beautifully landscaped gardens and many additional features, such as a pressurised water and heating system and a water filtration system. Deceptively spacious, this property warrants a viewing for anyone searching for their perfect family home."